Monet, S.j., Jacques. "Act of Union". The Canadian Encyclopedia, 05 February 2019, Historica Canada. https://www.thecanadianencyclopedia.ca/en/article/act-of-union. Accessed 18 April 2019. Article by Jacques Monet, S.j. The Act of Union was passed by the British Parliament in July 1840 and proclaimed 10 February 1841. It united the colonies of Upper Canada and Lower Canada under one government, creating the Province of Canada. Two nations warring in the bosom of a single state was Lord Durham's assessment of the relationship between Lower Canada's two linguistic communities (courtesy Library and Archives Canada/C-121846). First page (National Archives of Canada/MG40, E1). 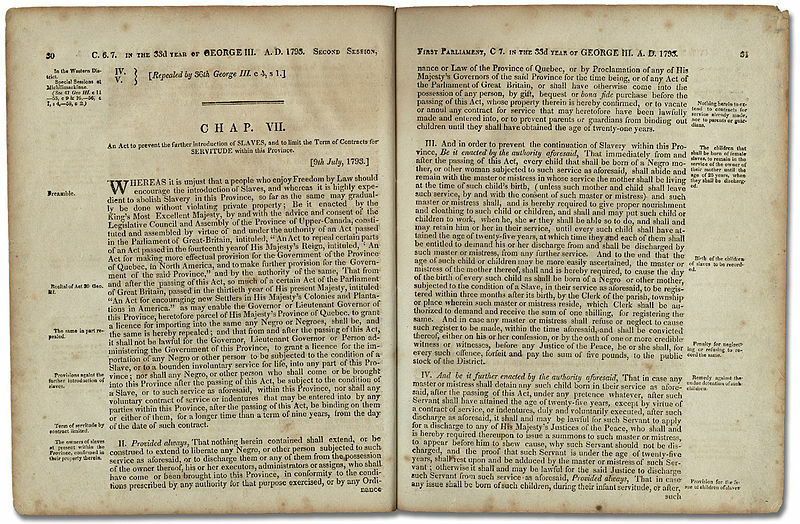 Sydenham persuaded the legislature of Upper Canada to consent to a union with Lower Canada and framed the Constitution of the united province (courtesy Metropolitan Toronto Library). 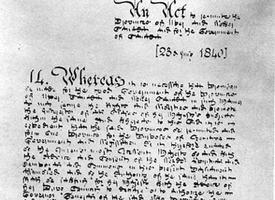 The Act of Union was passed by the British Parliament in July 1840 and proclaimed 10 February 1841. It united the colonies of Upper Canada and Lower Canada	under one government, creating the Province of Canada. The unification of Upper and Lower Canada was a recommendation of the 1839 Durham Report, after an imperial mission to investigate rebellions	in both colonies in 1837. Lord Durham proposed a united province to develop a common commercial system. A combined Canada would also have an overall English-speaking majority, to control the divisive forces Durham	saw in French Lower Canada, making it safe to grant the responsible government he also advocated. Britain agreed to union, though not to responsible government. The necessary legislation to establish the new Province of Canada was introduced in the British House of Commons in May 1839. 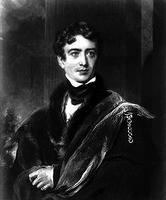 In September, Charles Poulett Thomson (later Lord Sydenham) was sent as governor general to acquire Canadian consent to the Act, which he obtained from Lower Canada in November and from Upper Canada in December. The resolutions of both Canadian legislative bodies were fused by Lower Canada Chief Justice James Stuart early in 1840. After passage in the British Parliament, the Act of Union was proclaimed on 10 February 1841 in Montréal. The Act's main provisions were the establishment of a single parliament with equal representation from each constituent section – now called Canada East and Canada West; consolidation of debt; a permanent Civil List (the list of officials on the government payroll); banishment of the French language from official government use; and suspension of specific French Canadian institutions relating to education and civil law. The Act naturally aroused considerable opposition. In Upper Canada, the Family Compact opposed union, and in Lower Canada religious and political leaders reacted against its anti-French measures. 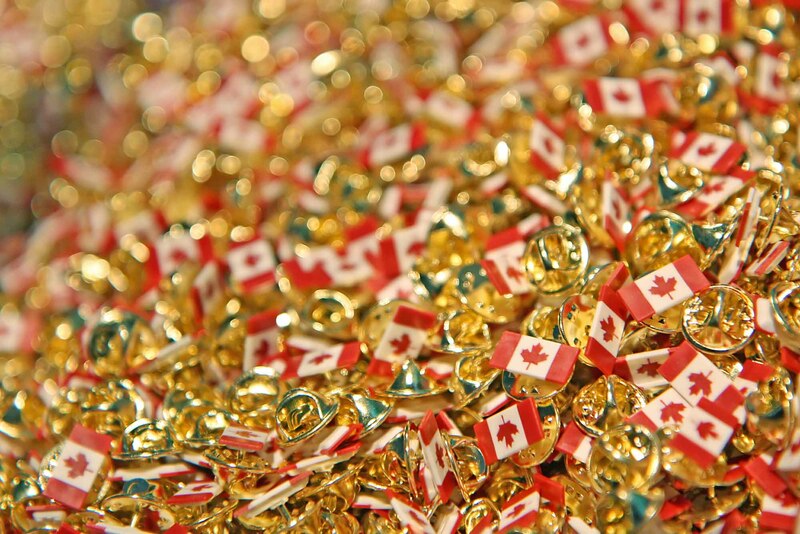 In fact, the Act was unfair to Lower Canada with its larger population and smaller debt. However, both Canadas agreed to work within the Act, especially under the liberal influence of the united Reform Party led by Louis Lafontaine	from Canada East and Robert Baldwin from Canada West. Within 15 years many unjust clauses were repealed. Economic prosperity brought wealth and growth to the united colony, and responsible government arrived — modifying many of the Act's financial and constitutional provisions.